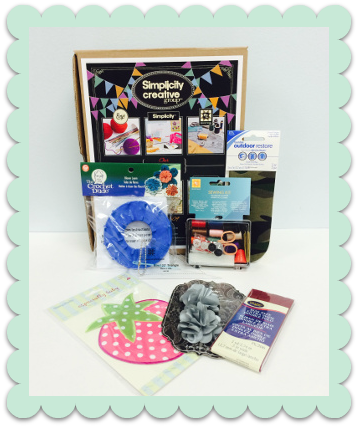 Congrats to yesterday’s winner, Joy Ainsworth, on winning Day 17’s daily giveaway! We will be in contact so that you can claim your prize. 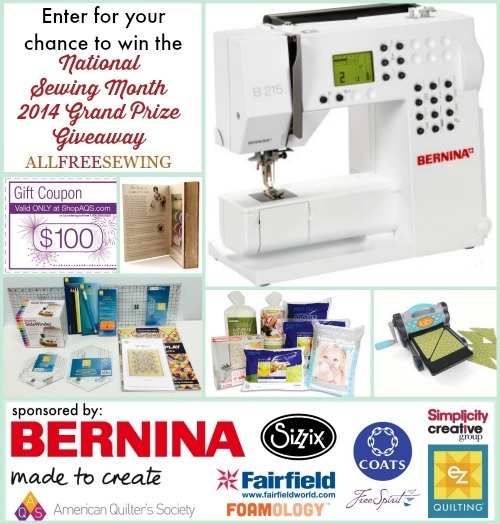 Today’s National Sewing Month post is brought to you by Autumn from It’s Always Autumn! 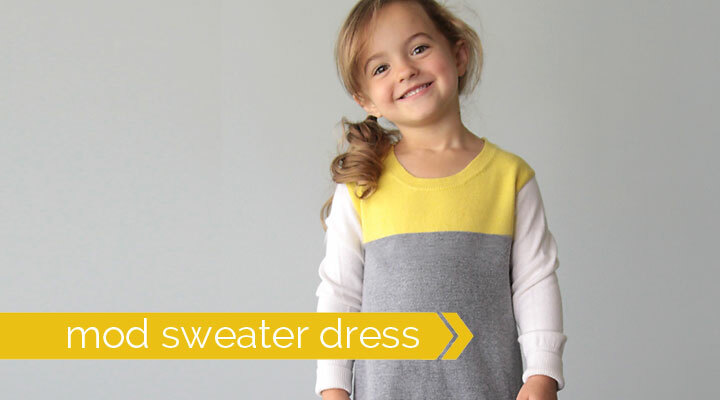 She’ll be showing us how to sew a sweater dress for a little girl – perfect for chilly weather. It’s not like any of the rest of those free dress patterns out there, though – this one is made from an old sweater! 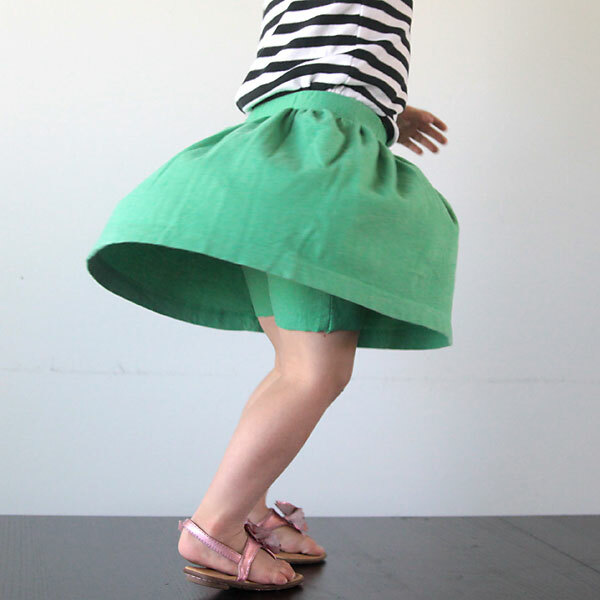 This easy dress pattern is perfect for the thrifty mama or grandma. Read on for the full tutorial! 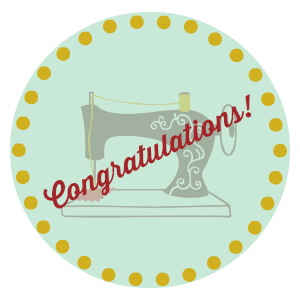 Sewing clothes can take a lot of time and cost a lot of money, which is why refashioning is such a great idea. 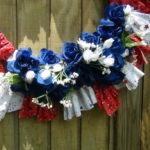 Taking an unused item and giving it new life as something else is not only fun, it’s usually inexpensive (or free!) and much faster than sewing the same garment from scratch. 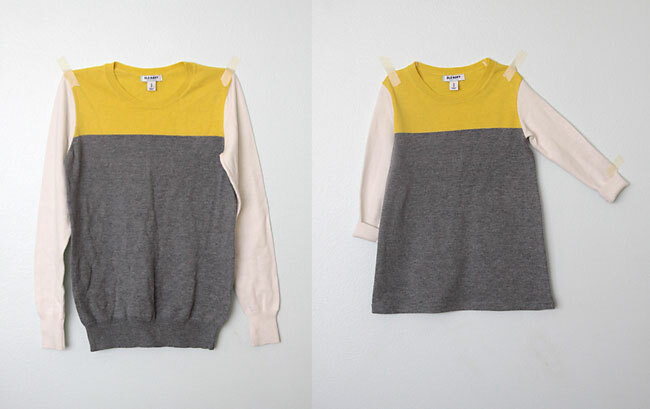 I especially like refashioning sweaters, since it can be hard to find sweater fabric in stores. 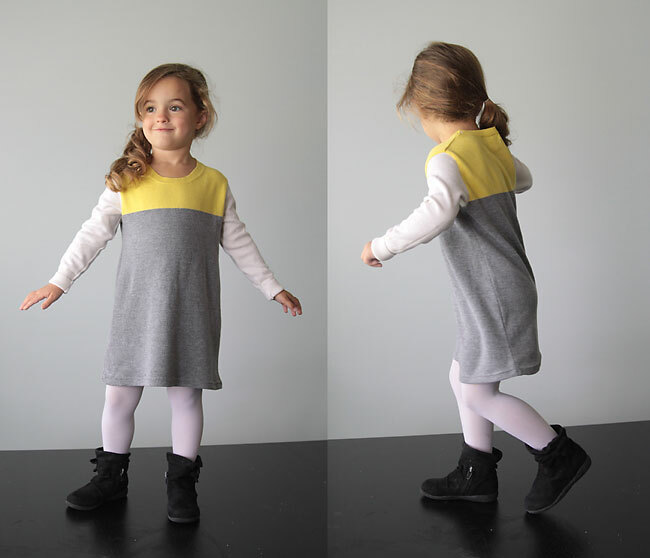 For today’s project I refashioned a women’s color blocked sweater into a mod shift dress for a little girl. 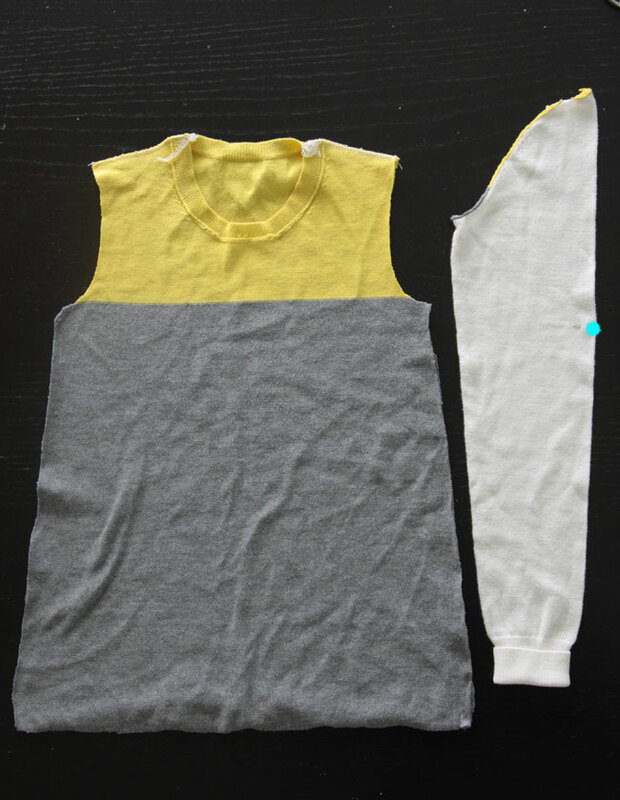 This project is very simple and can be pretty easily finished in about an hour using a t-shirt as a pattern. Here’s the before and after. 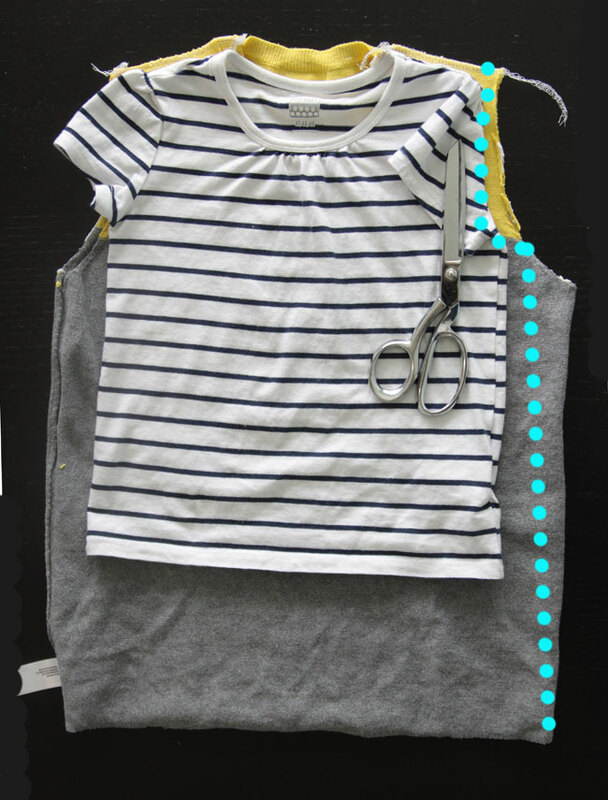 For this refashion method, you’ll need a sweater that’s long enough to be a dress on your little girl, but that has a fairly small neckline. A women’s size medium sweater with a crew neck worked perfectly for my daughter, who wears a 4T. You’ll start by cutting off the bottom ribbing and sleeves from the sweater. 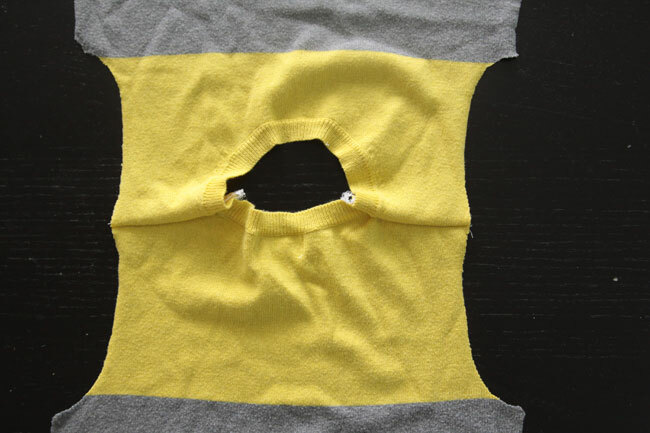 Turn what’s left of the sweater inside out and sew new shoulder seams as shown below. That will tighten up the neckline a little so it’s not too low on your little girl. 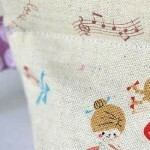 NOTE: if your seams are getting all stretched out as you sew, make sure your stitch length is set on the longest setting and increase your tension just a bit – that should help give you a smooth seam. Next, grab a tee that fits well and lay it over the sweater. 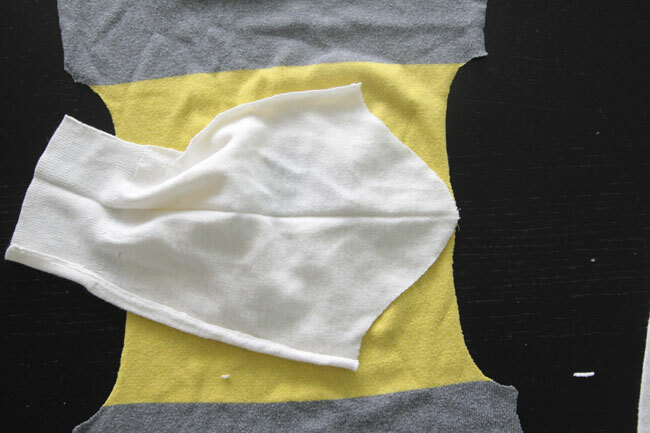 Fold back a sleeve and use the tee for reference to cut a new armscye, as shown below. Then just cut a straight line from the bottom of the arm curve down and out to the bottom of the sweater. Repeat on the other side (it’s a good idea to fold the sweater in half to make sure your cuts are the same on both sides. 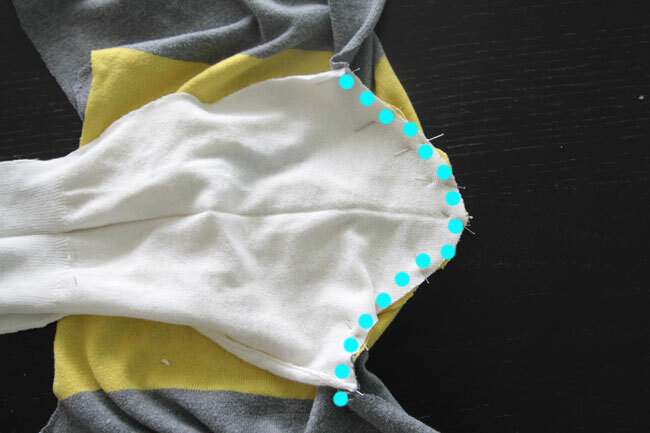 NOTE: anytime you use an existing garments as a pattern, be sure to add seam allowance! Now that the bodice of your dress is cut out, it’s time to cut out sleeves. 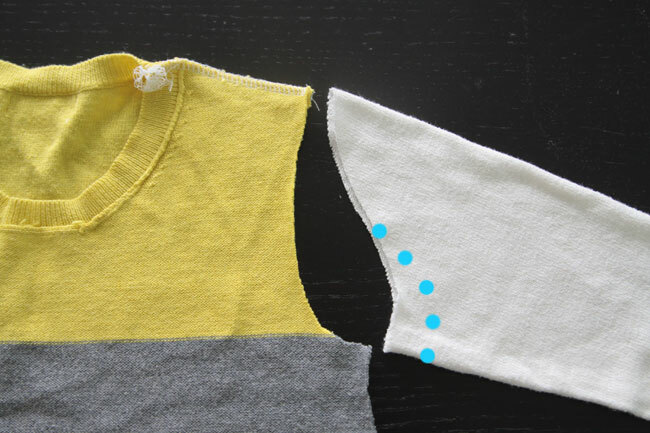 Try one of the sleeves on your little girl – pull it up until the it’s the right length (hits her wrist) and mark on it where it hits the top of her shoulder. Starting where you marked on the sleeve, cut down in an S-curve, as shown below. Getting the right curve for a sleeve takes a bit of trial and error, but the good thing about sweater fabric is that it has so much stretch it’s ok if your cut isn’t exactly right. I should have cut my curve down a little lower than I did (the dots show where I should have cut), but what I did worked just fine! If needed, also cut all the way down the sleeve the make it more narrow. 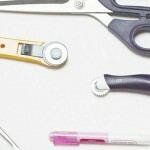 If you don’t need it to be more narrow, just cut it open along the seam line. Now we’ll attach the sleeves. Open the bodice up at the shoulder seams and lay it down as you see below, right side up. Open up one of your sleeves and lay it on top of the bodice, matching the top of the curve with the shoulder seam. The sleeve should be right side down, meaning right sides are together here. 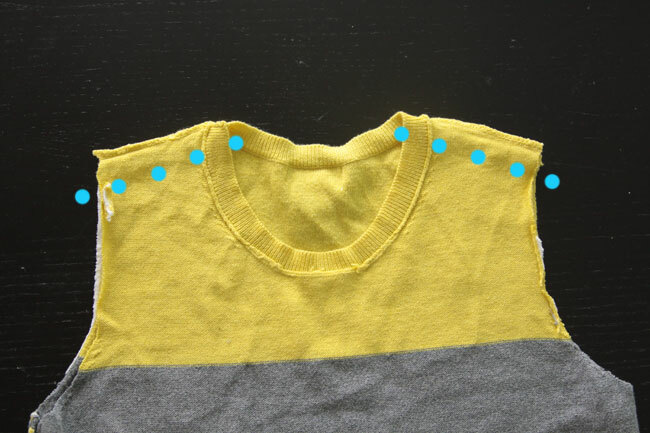 Pin the curve of the sleeves into the curve of the armscye, as you see below. You may need to gently stretch, or ease, either the sleeve or the armscye to get the edges to line up. Carefully sew the two pieces together. Repeat with the other sleeves. 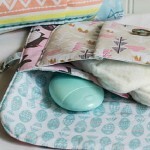 Now you can sew the side seams. Sew up the sleeve from the wrist, in a curve under the arm, and down the side seam to the bottom of the dress. I like to give my fabric a gentle stretch when I sew the curve under the arm to be sure the stitches won’t pop when the wearer raises her arms above her head. Fold up the bottom of the dress to the desired length, and stitch to hem. I did my hem with a double needle, which is a GREAT option for hemming stretchy clothing items. If you use a normal straight stitch and the hem gets stretched at all, the stitched will pop out. If you don’t know how to use a double needle, use a slight zig zag instead. Press all your seams. 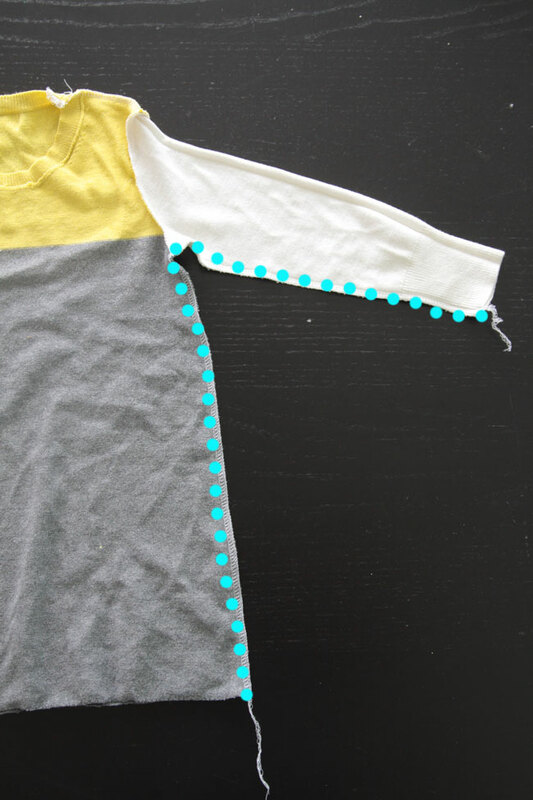 If you’ve used a serger and you have tails of thread at the shoulder seams and wrist, fold them down into the seam allowance, and stitch a small zigzag to keep the seam allowance in place (see a photo of that at the end of this 15 minute nightgown upcycle post). Otherwise, you’re done! Thanks for reading! 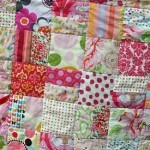 If you’d like to see more easy sewing and upcycling posts, check out my blog: It’s Always Autumn. 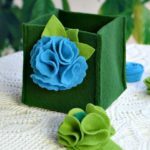 Don’t miss all of Autumn’s amazing projects at It’s Always Autumn! What is your favorite season (clothing-wise)? You have until tonight, September 18th, 2014 at 11:59p EST to leave your comment on this post. Comments posted after that will not be counted. Summer because you can dress lighter. I enjoy fall (not winter) because some days you might need a sweater, some days you might not. That’s the season where you can pretty much wear anything but shorts and be fine. Autumn with all the new back to school outfits is my favorite season for sure! Fall. I love layering sweaters or jackets over cotton tops. Fall! Love the cozy sweaters and jeans. Spring because you put the heavier clothes away. Winter because I love big cozy sweaters and leggings. Thanks! My favorite season clothing-wise is Summer. Shorts & tank tops. I don’t have a little girl but that was a great tutorial, by the way. I love summer, for dresses! Summer, anything goes, dress is so much more casual. I wore regular dress shoes this week for the 1st time since June and have blisters on my heels. Groan! Thanks. I think winter, because I can wear my handknits more. The rest of the year is too warm for them around here, but that’s not a complaint, just a fact. 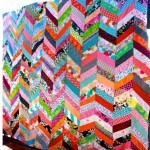 all seasons but mostly fall I love the bright colors and sewing makes me happy! It’s much easier to dress in the summer for sure, but I’m always ready for fall to appear! Spring is my favorite.After a cold and snowy winter it is so pleasant to use pastel tones and lighter fabrics. I love the spring! It is a relief from cold, stay inside weather and a chance to wear all of the pretty things you sewed while inside during the winter! Plan ahead! Autumn is my favorite, because it has the best selection of comfortable clothing in my opinion and seeing how many times you can re-design a sweater or hoodie is really fun! I prefer summer, but I really wear the same thing year round. I live in Texas so we don’t have that many months of winter. And since I am a homemaker, I can wear what ever I want. I prefer to wear shorts and t-shirts year round! Scarves, sweaters, leggings in beautiful rich tones….sounds like fall to me! Autumn is my favorite. After a hot muggy summer, I enjoy the cooler temperatures for walking and doing work around the house. Summer! Long, foley layers of floral print fabric is the best! I love Fall. Time for light jackets and cute sweaters. It’s a tie for me, with Fall and Spring as the winners. Spring is always so fun and exciting (with Summer just around the corner), and I love pulling out the bright colors and crazy patterns! Fall is just as amazing, as it’s so fun to mix and match the warm, rich color pallets with lots of layers!! Definitely a dead even tie!!! I love Spring – after the cold is gone – lighter happier clothes and colors! thanks! 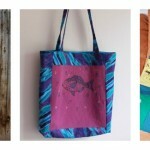 I love sewing for summer. So many cute patterns for tops! (Fall) for the bright fall colors and cool weather. Fall… not too hot, not too cold.. and I just love sweaters! Fall is my favorite. I love bringing out my layering pieces with jeans and boots. Summer I like wearing shorts, short sleeves and especially dresses. I like summer best short sleeves and dresses! Spring I like wearing dresses.